Holly offers a discount of 50% on their first / introductory lesson! 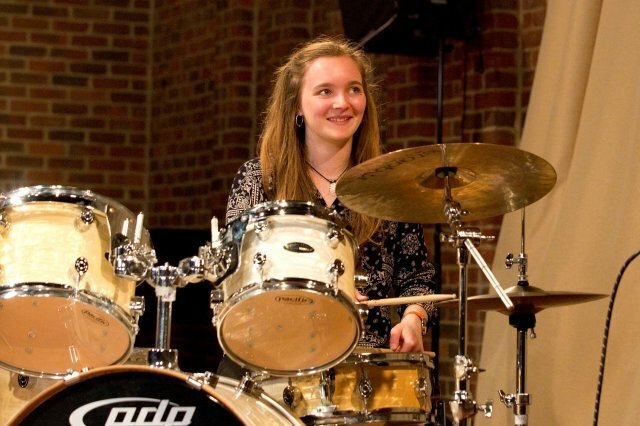 As a recent graduate from Southampton University I have extensive experience performing in a wide array of styles and settings, this includes Pop, Rock, Jazz, Latin, Funk, Show Music and Classical Percussion. I have been playing for well over 10 years and am a confident and extremely driven individual. Throughout my career I have performed at many UK and European music festivals including The Montreux Jazz Festival, Common People and Stompin on the Quomps. I feature on numerous records by local artists and am very active amongst the Southampton Music scene. I started teaching when I was still in school as a percussion academy leader for primary to lower secondary students, through this I taught samba, djembes, taiko, tuned percussion and group drum kit lessons. I then went on to lead the school percussion club. While at University I started teaching professionally with private students, some learning grades with others learning for fun. Furthermore, I also teach in a few schools and am starting work with a local teaching company who set teachers up in schools with the view of teaching individual lessons as well as group workshops and clubs. I adapt my approach to suit each individual student, whether they like to learn via reading music and grade pieces, playing along to music or learning visually or by ear. I am able to think quickly and change my lesson plan on the spot if necessary and create my own worksheets and technique exercise's.My goal is for each student to reach their full potential as a drummer and for them to enjoy learning with me.